Take a trail ride through the meadows and pine forest of the Cascade Mountains with Flying Horseshoe Ranch. 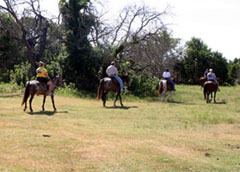 Happy Trails Horse Adventures serves up Western fun year-round, including horseback rides, hay rides, wagon trains and sleigh rides. Please telephone for reservations only (e-mail reservations cannot be accepted. High Country Outfitters presents spring, summer and fall trail rides, pack trips and clinics. Iron Horse Park offers over 100 miles of hiking, mountain biking, cross-country skiing and snowshoeing trails as well as fly fishing and birdwatching. For backcountry adventures, Three Peaks Outfitters offers hunting, trail rides and pack trips.